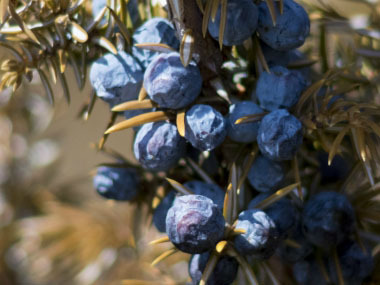 The common juniper, also known as Siberian juniper or dwarf juniper, globally is the most widespread of the juniper species, and many subspecies and varieties have been described. 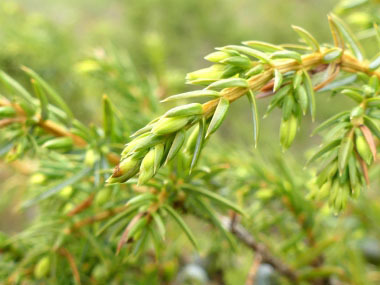 It is in the Cupressaceae family (Cypress) with 70 to 80 species growing in the northern hemisphere. 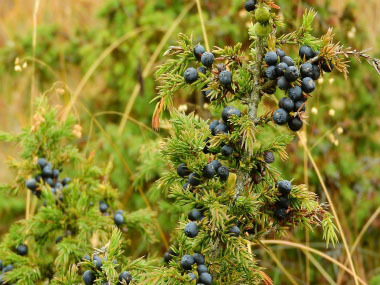 Common juniper is a dioecious, slightly poisonous shrub or small tree which can become over 200 years old. Its growth habit varies greatly: it can be anything from a creeping dwarf shrub to a pillar-shaped dense-crowned tree. Trunk/bark: Common junipers have no central trunk but rather multiple spreading to ascending branches. These typically reach to up to 17 cm (7.5”) in diameter at their base, with thin, gray brown bark that becomes flaky or shredding with age. Prostrate stems can form vegetative roots when coming in contact with the soil, forming low mats. The bark is fibrous, exfoliating in thin strips, that of small branchlets (5-10 mm diam.) smooth, that of larger branchlets exfoliating in strips and plates. Branches/twigs: Branches spread or ascend; branchlets are erect. Twigs are reddish-brown. 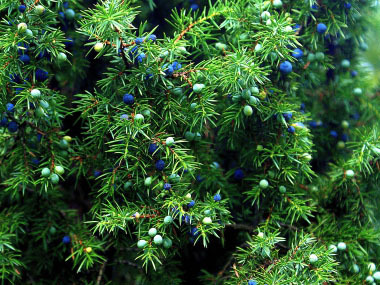 Height: Depending on whether this grows as a shrub or tree the common juniper can grow anywhere from to 1 to 10 metres (3 to 30') at maturity. Leaves: Leaves are green but sometimes appear silver when glaucous. They are stiff, sharp-pointed, flat, 0.5 to 2 cm (0.2 to 0.8 “) long needles with a relatively broad base. Leaves have a glossy green lower surface, and bluish-green upper surface. Leaves are borne in whorls of three. Flowers: Small, lacking perianth. Female and male flowers occur on different shrubs. Female inflorescences are yellowish-green, male flowers yellow. Borne in groups of three in the leaf axils. Fruit: Green when young, ripening to blue. The berries have a soft, mealy, sweet, and resinous flesh. 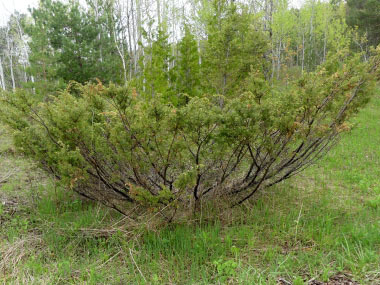 Habitat: Common junipers grow in dry or moist coniferous or mixed forests, broadleaf woods, rock outcrops, dry pastures, forest clearings, and even in field and road margins. 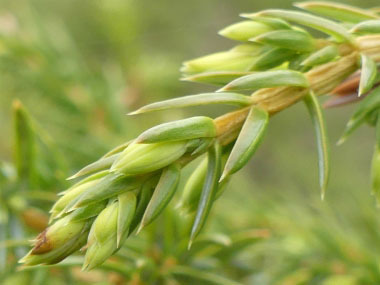 This is the most widespread conifer in the world, native to temperate Eurasia, Canada and the U.S., this can grow in an extraordinary range of habitats. They are intolerant of shade. 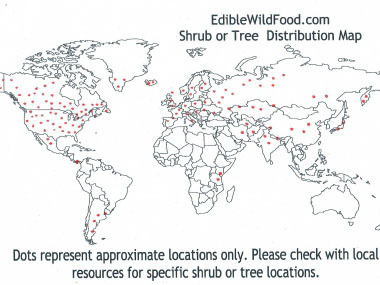 Edible parts: The berries can be used raw or cooked. They are usually harvested in the autumn when fully ripe and then dried for later use. The fruit is often used as a flavouring and it is an essential ingredient of gin. A tea is made by boiling the leaves and stems. Berries can be used a tea as well. The berries are well-known as being medicinal.